NSW led all the way in a tight contest. NSW gained the lead through the first 500 metres and strengthened that lead through to the 1000 metre mark. SA made a strong challenge in the third 500 metres narrowing the margin and setting up a great finish. 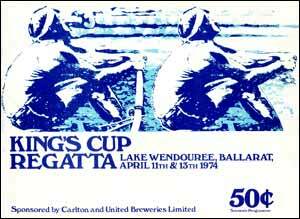 However NSW moved away in the final stages of the race to win by half a length. George Petlin lead all the way to win from Paul Rowe who challenged in the last 500 metres to bring the winning margin down to 1.6 seconds. There was a good race for the third placing with the margin down to only 0.2 seconds. This was a strong win from Victoria who held off challenges at two stages of the race from SA. 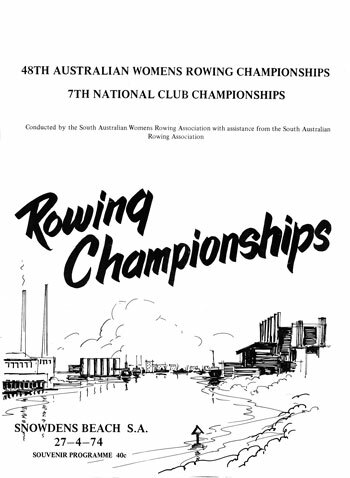 This Victorian crew went onto win Australia's first FISA lightweight championship and formed the basis for many other international lightweight successes for Australia. A great race to inaugurate this event with the winning Tasmanian crew winning by 0.6 seconds to NSW No 2 with 2.1 seconds further back to the VIC No 2 crew. Most crews designated No 2 were school crews. This was a close race for most of the 1000 metres between NSW, VIC and WA before NSW broke free in the final 250 metres to take the race easily by 2 1/2 lengths. This was Shirley Graham's second successive win in this event. She was selected to represent Australia at the World Championships in Lucerne Switzerland.